Vic Sage was the smartest investigative reporter in Hub city, but he could only get so far playing by the rules. So Vic invented an alter ego to prowl Hub's back alleys - a facelss enigma known to criminals as "The Question." His war on crime brought him into conflict with Lady Shiva, the world's deadliest martial artist. Killed in that battle, he was revived and trained by Kung Fu master Richard Dragon. Since his brush with death, the Question returned to action driven by a new philosophy and a burning need to expose corruption and injustice to the cold light of day. Like the Hawkgirl figure, this figure is inspired more by the look of the character on the JLU TV show than by his classic appearances. The yellow shirt and bright blue jacket and hat have been there since the beginning though, and combined with the faceless head the figure really stands out on the shelf. He's also an interesting mix of parts from other figures and features the first use of "real-life" inspired Movie Master parts in the comic based DCU line. 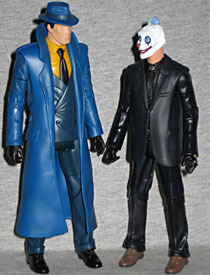 The base of the figure is the Movie Masters Gotham City Thug (same used for Bank Robber Joker and presumably Harvey Dent and Two-Face to boot), meaning it's the same torso, pelvis and legs. The shoes are new, so he's got that going for him. The arms are almost totally new too, but use the same lower biceps as the Joker but thankfully have new, less-squared-at-the-tops shoulder pieces. The right lower arm is the same as the Movie Masters figures' once again, but unlike those figures, which use the same lower sculpt on both arms (despite that meaning that the cuff buttons are on the inside seam on the left arm) the Question has a new left lower arm, and both gloved hands are new sculpts. 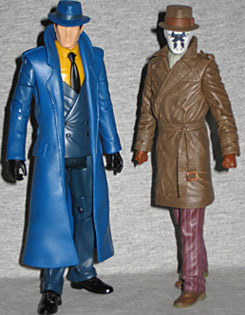 The trenchcoat piece is all new, as well, but the button-up jacket portion is part of that mold (it's glued & buttoned on the right side). It makes sense, all things considered, but is still a bummer. I'd far rather have reused feet and hands with a newly tooled torso or whatever it would have taken, but that's just me. The head is, of course, a new sculpt, done in two parts so the hat is a separate mold from the head (but is not removable). The paint is good, but minimal. All buttons are painted black as is the headband and hair while the neck, "face" and ears are painted "Caucasian flesh" (I hope that's a real color somewhere - it'd be hilarious to see that on a bucket of paint or what have you). The shoes are a high gloss black and the gloves a dull black. 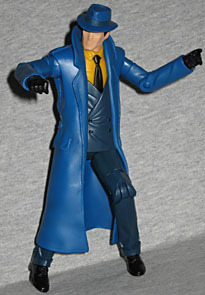 The jacket section on the front of the trenchcoat is painted to match the dark blue of the legs, but everything else is just cast in its predominant color. That's really a bummer for the yellow shirt, which is shiny as all get out (like any light-colored plastic). Articulation is completely standard for DCU, though the coat piece really inhibits the torso joint. The head appears to suffer from that most horrible of failings - the double-barbell balljoint resulting in only horizontal motion. That's really a crime on this figure, because his noir-ish nature makes this one really want that range of motion - to look down at evidence or up into the rain. Oh well... it wouldn't be Mattel if they didn't consciously lessen a figure in some big way. At least they have a consistent style. Accessories are relegated exclusively to Kilowog's huge right leg. It's the same as his huge left leg, no surprise there. They're necessarily plain. When Alan Moore began work on Watchmen the plan was to use all of the characters DC purchased from Charleton Comics, but editors ultimately put the kibosh on that, so he had to create new ones, thinly veiled though they were. In a great sense of cyclical cosmic irony, the Question was a little known C-Stringer who inspired Moore's Rorschach, who then in turn inspired JLU's version of the Question, which worked so well it turned him into a major player again. And with that renewed interest comes renewed respect and a pretty darn good figure of the character. It's not perfect, but DCU rarely is, but this is just about as good as we could hope for. It's a fine figure and well worth it beyond the inclusion of the necessary-to-build-Kilowog bodypart.